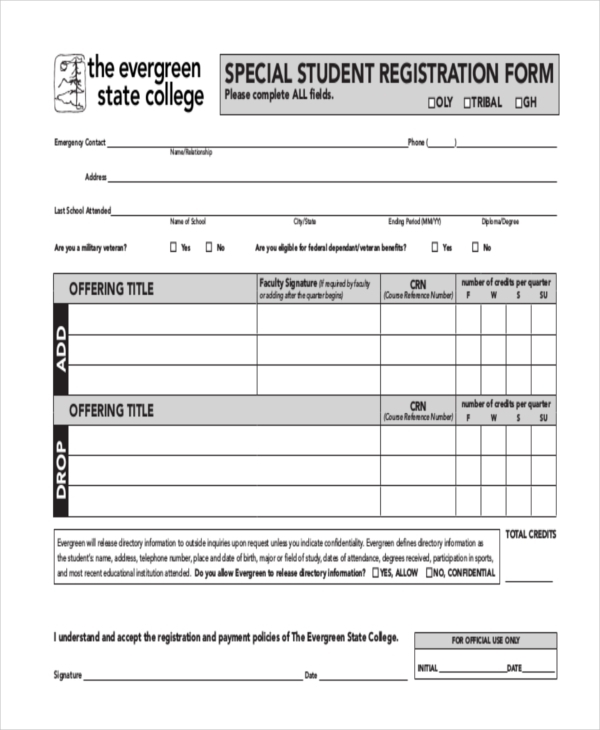 A student registration form is an indicative of the name form that is used to register a student for an educational institution or an event. The student is required to fill in his personal details along with the details of previous schools and courses attended by him. The concerned authorities may also expect him to furnish copies of various documents that prove the credentials listed by him in the form. You may also Useful Payroll Register Forms. 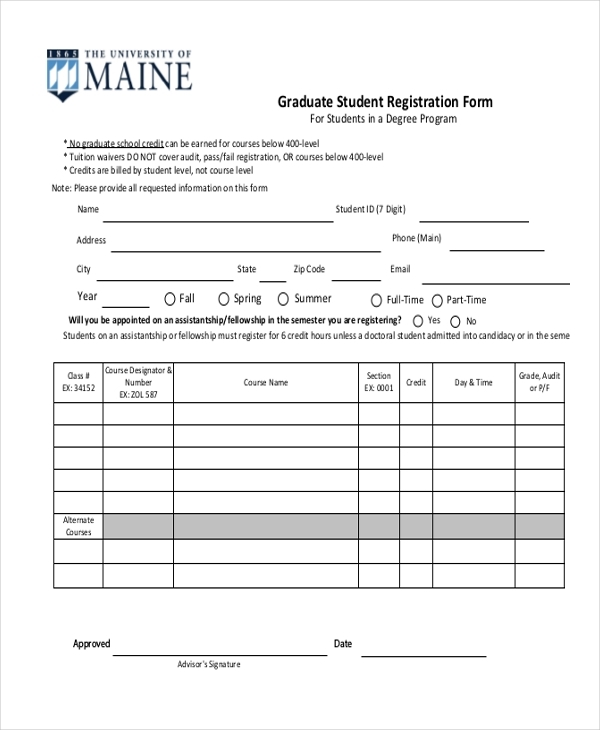 This form is used by a university during the enrollment process to get a student registered into a graduation course. 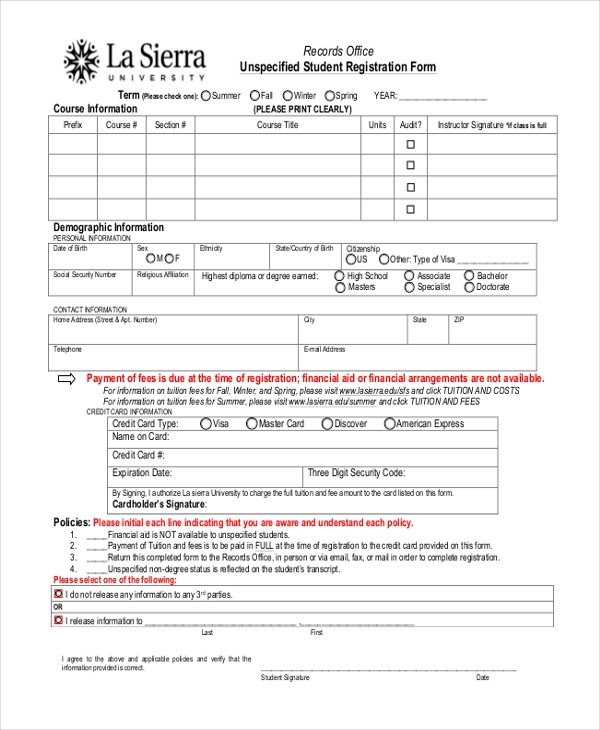 A university requires a student to fill in this form if he belongs to another university and is joining the present one due to some emergency for a short period of time. As the name suggests, this form is used by a university to get students of other ethnicity registered into various courses offered by it. A student who may be joining a university only for a short period is required to fill this form with necessary details to register in a course. When a student of another university wishes to register himself in a university course somewhere with an intention to transfer his credentials to his parent university, he is required to fill this form. 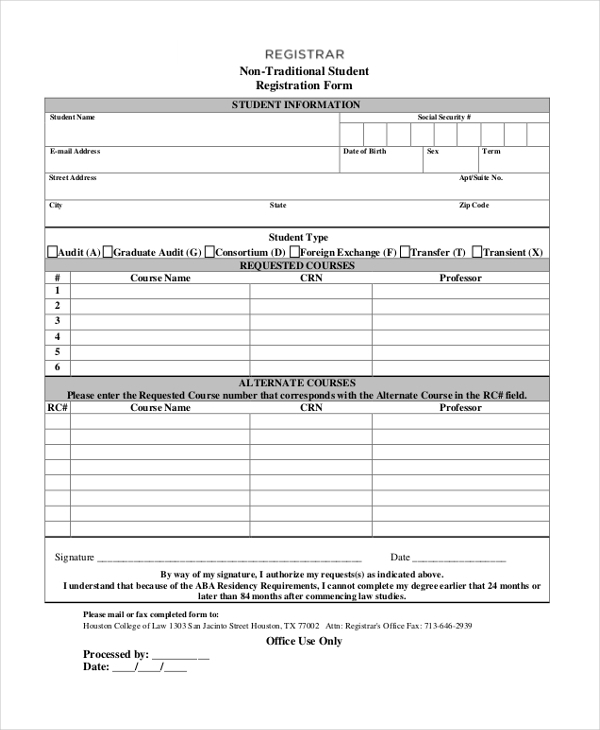 Whenever an undergraduate wishes to register himself to a university course, he is required to fill in this form with relevant details. This form is used by a university to get a student of international origin, registered and enrolled into one of its courses. 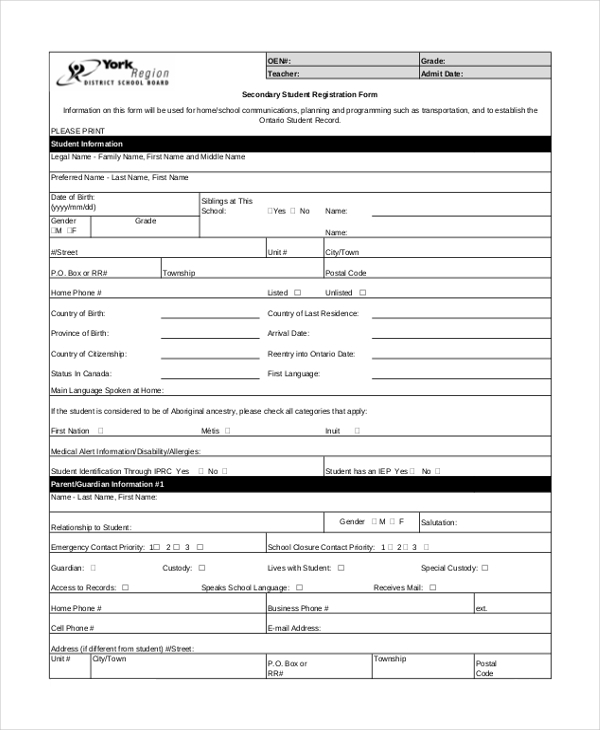 Whenever a non-traditional student like a student on an exchange program or transient student wishes to register in a university, he needs to fill this form. 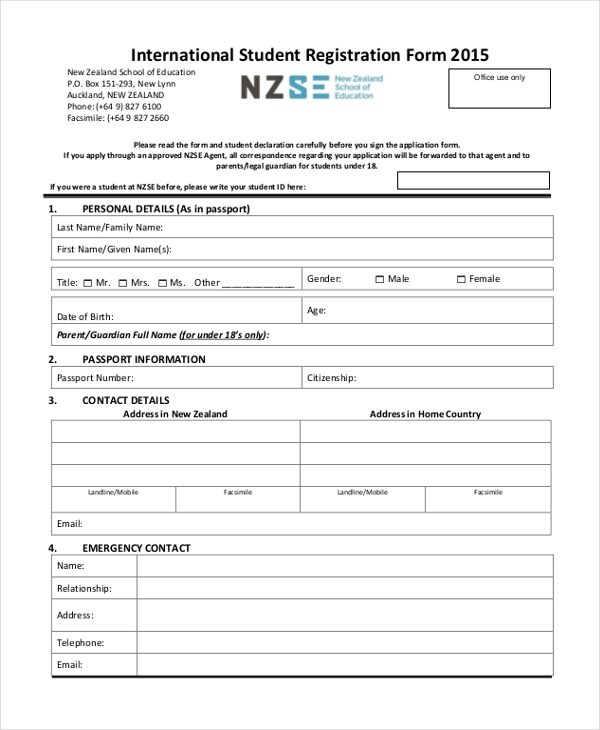 This form is used in schools to register a student for their secondary courses. 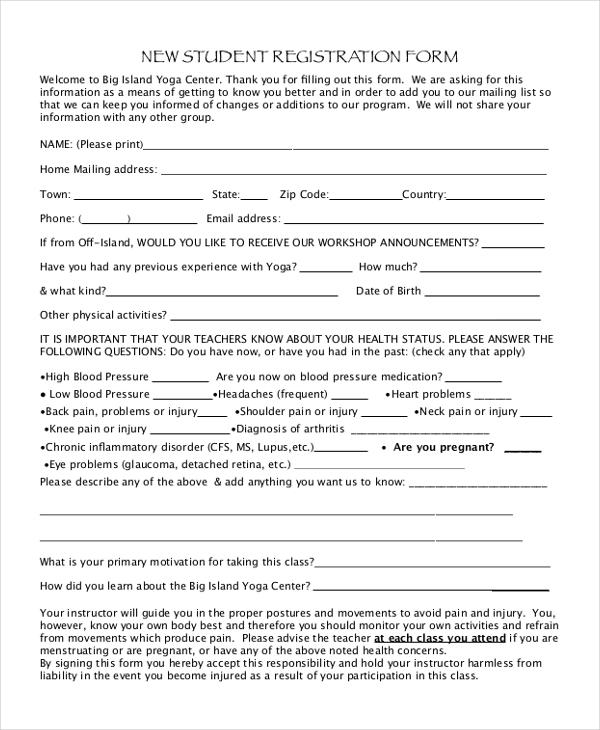 The student needs to fill in the form with relevant details. 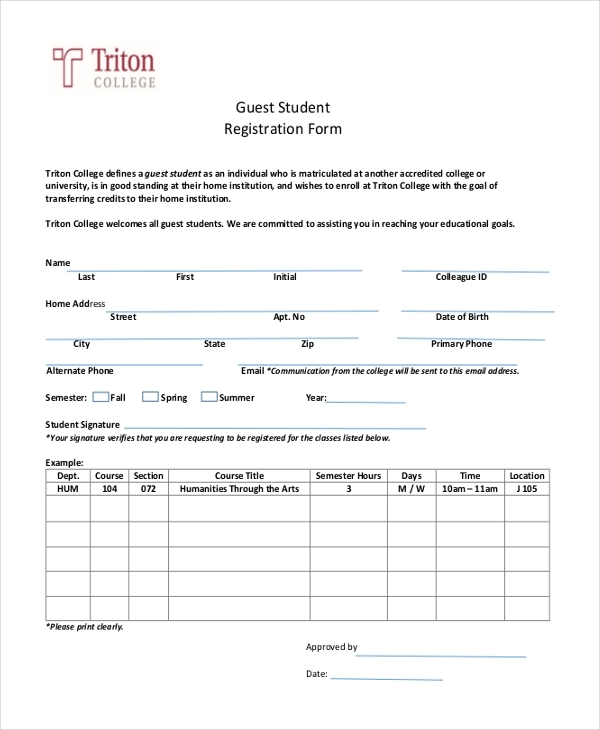 This form is used by a school, college or university to gain information about a new student who wishes to register for a course. Who Should Use a Student Registration Form? 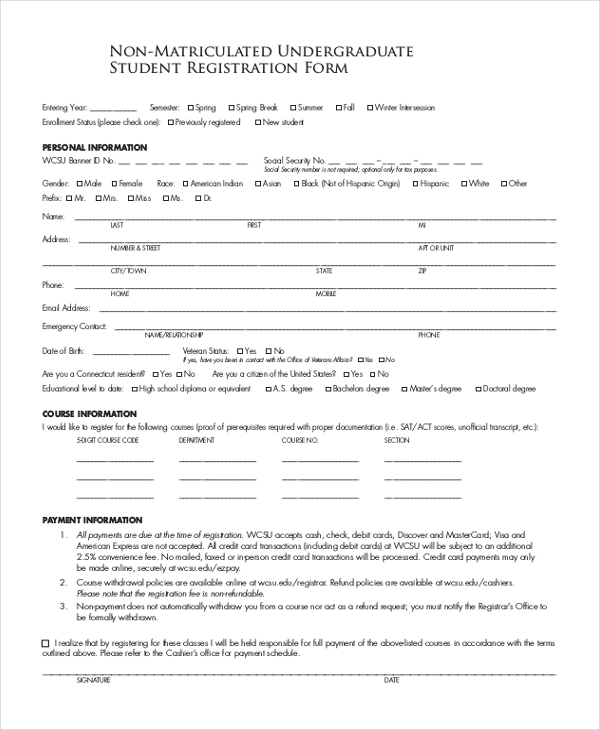 student registration form is used to register a student for any given course of event in an educational institution. Thus, it should be used by any organization that works at close quarters with the students. So, schools, colleges, and universities that offer courses to students of their own country as well as from other countries can use this form to get necessary information from them before registering them to a course. Useful Hotel Registration Forms. What are the Benefits of Using a Student Registration Form? There are a number of benefits of using a student registration form. The form can be used as a legal evidence in case any of the information furnished by the student proves to be wrong or made up. 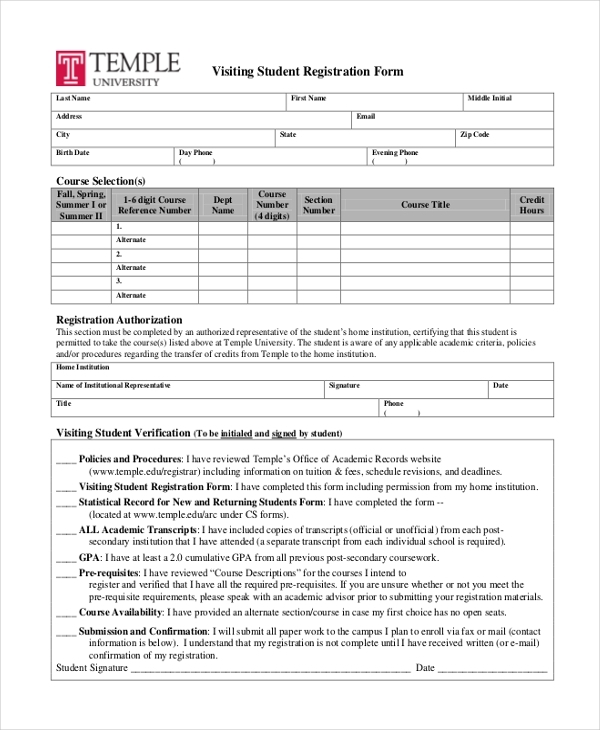 How Can You Design a Student Registration Form? Add a logo and name of the university on the top of the form and follow this with the address and contact details. This should be followed by a segment where the student needs to add in his personal details like name, age, nationality, earlier institutions attended, aggregate, course sought etc. Then there should be a segment where the parents’ details should be added. You can also add a separate segment with the rules and regulations to be adhered by the student. You can also see NGO Registration Forms. A student registration form is an official document which helps in collecting detailed information from the student. Thus, this should be designed with utmost care. In case you are not sure how to do this, look for student registration forms on-line. These are readily available and can be easily downloaded. You can make changes to these forms to customize them as per your needs.